A very restricted diet containing just a few foods isn't a healthy or lasting way to lose weight, making diets such as the oatmeal diet less-than-ideal choices for weight loss. However, while oatmeal isn't a weight-loss miracle food, it may have some weight-loss benefits when eaten in moderation as part of a reduced-calorie diet containing a variety of different nutritious foods. There are a few different variations of the oatmeal diet, including one in which a person only eats oatmeal for the first week and then eats oatmeal three times a day along with other foods, totalling no more than 1,300 calories per day. The calorie content of either of these two versions of this diet is lower than recommended for many people and won't provide the minimum recommended amounts of many nutrients. The healthier alternative is the version in which a person eats oatmeal for two meals a day and then has a nutritious dinner, which might consist of a lean protein source like fish or skinless chicken breast, a starchy food like brown rice and vegetables, such as a salad or cooked broccoli or carrots. Even better from a nutritional standpoint would be to have oatmeal for breakfast and perhaps a snack and eat well-balanced meals containing multiple food groups for lunch and dinner. Even just replacing your regular breakfast cereal with oatmeal may help you lose weight because of its potential effects on appetite. Eating oatmeal instead of a ready-to-eat cereal may help you eat less while feeling fuller, according to a study published in the Journal of the American College of Nutrition in 2013. This could help you decrease your daily calorie consumption so you can lose weight. Another study published in the same journal in August 2015 found this effect occurs even with instant oatmeal. This increase in satiety is most likely due to a type of soluble fiber, called beta-glucan, which is found in oatmeal. Oatmeal, even instant oatmeal, is a whole grain. People who consume more whole grains also tend to weigh less, according to a study published in Nutrition Research in December 2010. Whole grains take longer to chew, which may help you eat less by slowing down the speed at which you eat and increasing feelings of fullness, according to a review article published in Advances in Nutrition in 2012. Whole grains also usually have a lower energy density or contain fewer calories per gram, than refined grains, helping you to fill up on fewer calories. One reason for this lower energy density is the higher fiber content of whole grains. For example, a 1-cup serving of cooked oatmeal has 4 grams of fiber out of the recommended daily value of 25 grams. People who eat more fiber tend to be less likely to gain weight or increase their waist circumference, according to a study published in The American Journal of Clinical Nutrition in 2010. Although instant, quick and regular rolled oats all have a similar nutrient content, rolled or steel-cuts oats may be a better choice than instant for weight loss. This is because instant oats are more processed and thus more quickly digested, leading to a quicker rise in blood sugar levels. In other words, instant oats have a high glycemic index, while rolled oats and steel-cut oats have a low glycemic index. A review article published on the Cochrane Library website noted that people who mainly eat food with a lower glycemic index may lose slightly more weight than those with a high-glycemic-index diet. 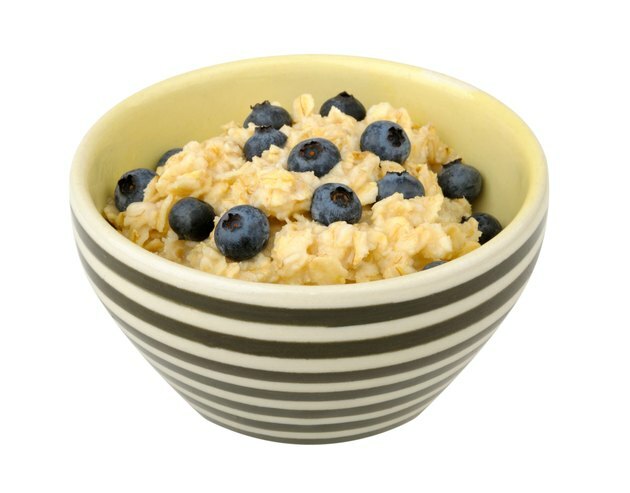 Simply adding oatmeal to whatever foods you're already eating isn't likely to lead to weight loss. For this, you'll need to eat oatmeal instead of other higher-calorie foods and decrease your total daily calorie consumption. To lose a pound per week, you'll need to create a 500-calorie deficit each day, either by eating less or exercising more. Just be careful not to cut calories too much, as this could slow down your metabolism. Women should eat at least 1,200 calories each day, and men need to eat at least 1,800 calories each day to prevent this. Plain oatmeal is pretty boring and doesn't contain all the nutrients you need. Prepackaged flavored varieties are a lot higher in sugar without contributing much in the way of nutrition, but you can add nutrients and flavor to plain oatmeal without greatly increasing the calories. Consider stirring in a small amount of plain fat-free Greek yogurt to give your oatmeal a little tang as well as a calcium and protein boost. Mix with sliced fruit to make your oatmeal a little sweeter or chopped nuts to provide some crunch. Either option will increase the vitamins and minerals in your meal, and nuts will give you some more protein along with a little healthy unsaturated fat. A tasty mix of 2 tablespoons of diced apple and a tablespoon of creamy peanut butter will only add about 125 calories to the 166 calories found in a 1-cup serving of oatmeal prepared with water.